“Our goal has always been to spend our lives making music,” say Robin and Linda Williams, and after 40 years and 21 albums together, the husband-and-wife duo is off to a good start. Here’s how the Raleigh News & Observer describes their latest album, These Old Dark Hills: “At a time when country music has misplaced its soul, hearing Robin and Linda Williams harmonize is like happening upon an artesian well as you’re about to die from thirst.” With Robin on guitar and Linda on clawhammer banjo and guitar, the two perform an irresistible blend of bluegrass, traditional mountain folk ballads, gospel, and country. Robin was born in Charlotte, North Carolina, Linda was born in Anniston, Alabama, and they met in Myrtle Beach in 1971, but it was up north, in Minnesota, where they recorded their first album in 1975 and were soon invited to perform on a little radio show just getting off the ground, A Prairie Home Companion. Since then, they’ve appeared on the show many times and also in the Robert Altman movie of the same name, as well as playing in The Hopeful Gospel Quartet with Garrison Keillor and Kate MacKenzie. In addition, they’ve performed at the Grand Ole Opry and on such programs as Mountain Stage, Music City Tonight, and Austin City Limits. 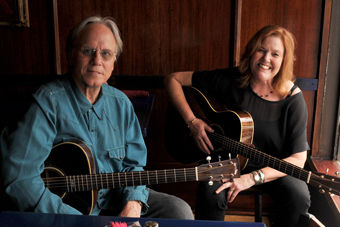 Such artists as Tom T. Hall, Mary Chapin Carpenter, and Kathy Mattea have recorded their songs. In the words of David Johnson of the Boston Globe, “Among contemporary country performers, Robin and Linda Williams shine like a diamond amid rhinestones. Their sound is so sincere as to give the listener chills.” So come to the show – and bring a sweater!